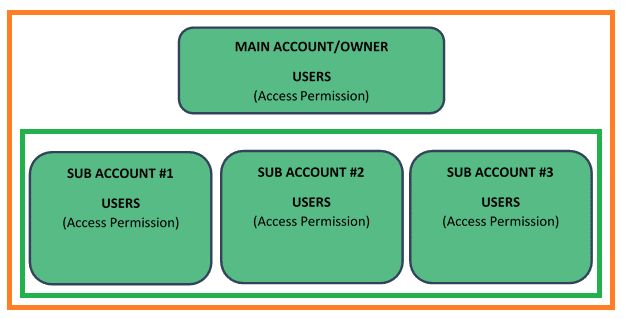 This article covers the hierarchical relationship of VWO accounts, users and sub-accounts. As an administrator, you can add multiple users and sub-accounts to help collaboration between different stakeholders in a project. You can add users to an account to facilitate smooth collaboration between members in a project. When you add a user, you identify the person by the email address registered in VWO and you assign the appropriate access level for each user. The access level indicates the actions users can perform in VWO. As an account administrator or owner, you can create sub-accounts to organize customers or products you handle into separate categories. In most cases, sub-account feature is used by agencies handling multiple customers and need to manage a separate account for each customer. It can also be used in a large enterprise setup where different teams need to run their own tests on varying domain names. Each sub-account can have multiple users under them and can be assigned different access level (Browse, Design, Publish, Admin) to each user. However, users under a sub-account will be restricted only to the sub-account and cannot view data outside the sub-account. For example, a user with admin privileges in sub-account 1 cannot view data related to sub account 2. Furthermore, if a sub-account is disabled from the main account, the users under sub-account will not be able to login to VWO.